A British witness at Swindon, Wiltshire, reported a hovering, triangle-shaped UFO less than 70 feet off of the ground, according to testimony in Case 64480 from the Mutual UFO Network (MUFON) witness reporting database. The witness was at Drove Road near the Magic Roundabout Intersection with very good visibility and ambient light just after dusk with streetlights in the area about 8 p.m. on October 3, 2014, when the incident occurred. 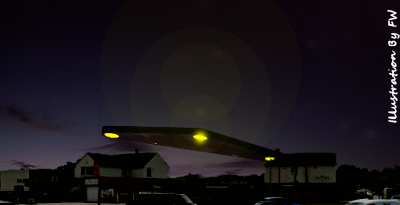 “A triangular craft was seen floating above the quiet residential area immediately to the east of Drove Road, Swindon, for a short period of time before moving away in a manner inconsistent with a sighting of any conventional craft,” the witness stated. The witness said the object was hovering.